New Baby Congratulations Welcoming a new baby into the world is an exciting time for everyone. 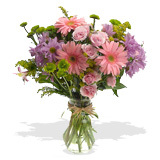 New baby congratulation flowers have typically been pink for a new baby girl and blue for a new baby boy. Say congratulations to the new parents with traditionally colored congratulation flowers or choose a different color to mark the occasion. A new baby congratulation flower will add extra joy to the new parents as it is a reminder they have bought a new life into the world.